In our example we defined a gateway in 'parmfile.txt' so we can choose '< Yes >', but if you do not have a gateway, you can choose '< No >'. Press Enter to accept the default from 'parmfile.txt', or type in the IP address of your gateway. Now that we confirmed our local network configuration, we'll go to the next step. I saved the packages on my host computer, so I'll put its IP address here. Fill in this field with the correct address for your installation and press Enter. 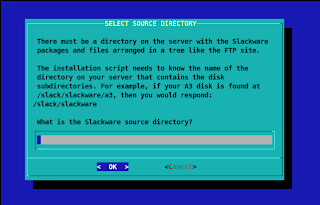 This would be (download)/slackware where you need to substitute '(download)' with the correct path. Be careful to type the path exactly as you defined it in your /etc/exports file. We'll switch into text mode here so you can see if you have any errors. 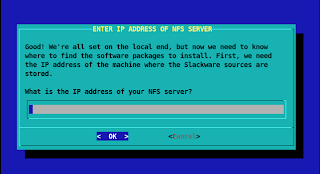 Do you need to try setting up NFS again ([y]es, [n]o)? Check if the last line in the displayed mount table shows your download directory on the NFS server mounted in your emulated mainframe. If anything went wrong, press 'y' to try other settings. If all is well, press 'n'.